In the new chapter, you’ll see how to build a tool that works on CSV files, parses lines into sales records and then performs calculations on the data. 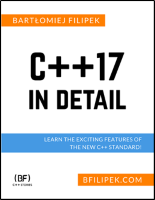 The code uses many C++17 features. You’ll see how easy it is to add parallel execution to selected algorithms and have a performance improvement across the whole application. In the end, we’ll discuss problems that we found along the way and possible future enhancements.